Last month we talked about Hephaestus, the Greek god of fire and volcanoes, whose fires helped forge some of the greatest legendary items of all time. This month we’re discussing Pele, the Hawaiian goddess of fire and volcanoes who uses her fires to demonstrate her power and emotions. Let me start out by saying that Pele is a beautiful woman. 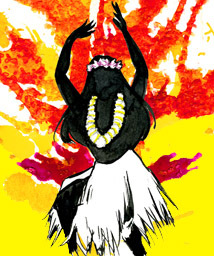 Sure most goddesses are attractive but Pele is beautiful and the bad girl diva of the Hawaiian pantheon. When Pele appears to mortals in human form and busts out the hula dance, of which she is one of the patrons of, hot times literally and figuratively occur! With that being said, now it should come as no surprise to learn that Pele ended up in Hawaii after fleeing her sister, Na-maka-o-kaha’I the Goddess of Water and Sea who was more than a little upset at Pele’s indiscretions with her husband. In fact, most stories about Pele involve her torrid affairs, generally with very handsome mortal chiefs. There is one story I like about Pele that for once does not involve her totally dominating her potential partner. A demi-god named Kamapua’a proved to be quite the match for her. Where Pele would cover the land with lava creating barren landscapes, Kamapua’a would bring down torrents of rain to extinguish the fires and then since he was the God of Pigs, he would call wild boars to come and break up the earth so that seeds could be sown there. These two fought against each other for so long that eventually Pele’s brothers begged her to give him a chance. They feared Kamapua’a would make it rain so long that Pele may lose her abilities to even create fire! So at a place called Ka-lua-o-Pele, where the land appears to have been torn up, is where it is said that Kamapua’a finally caught and ravaged Pele. The two stayed lovers until a child was born, at which point he left and Pele went back on the prowl for another man. Moreover, much like our modern day tabloids, the volcanoes let people know what is going on in Pele’s love life. When there are squabbles, there are jets of steam and smoke, and when there are fights, there is lava. In my opinion, not only is Pele an ancient goddess, but she is so potent that she crosses over to urban legend as well. Stories are told of Pele appearing as an old haggard woman asking strangers for food and drink. Those that help her are rewarded; those who do not are punished. What is noteworthy here is that these stories are not always ancient; there are modern tellings as well. In these more modern times, she sometimes is dressed in white and asks for a ride across the island. When the driver looks in his rearview mirror, she is gone. This bears some similarities to the woman in white stories that our urban legend fans will recognize. Another religious, yet urban folklore type thing is the removal of volcanic rock from the islands. Religiously speaking, should you take something of Pele’s without her express permission, a cavern of bubbling churning lava tells you the answer is a resounding “No!” When tourists started visiting the islands, and more specifically the volcanoes, park rangers would warn that removing volcanic rock would cause you to be cursed by Pele. Many say the park rangers made up this whole thing to keep people from removing mounds of volcanic rock from these historical landmarks, but that does not stop people from mailing volcanic rock back to the islands asking for forgiveness and for the curse to be lifted. If you want to learn more, or perhaps have some volcanic rock of your own to return, you should check out these guys: http://www.volcanogallery.com/lavarock.htm. What is the appeal of Pele? Why after so much time is she still so relevant in the lives of people? For starters, as long as there are volcanoes in Hawaii, there is proof that Pele is around. In addition, I find Pele appealing because she embodies womanhood in a very true, if more exaggerated way. Pele’s blend of beauty, grace, sexuality, and desire for vengeance are always portrayed in very recognizable ways. In my opinion, as long as there are wild women, there will be a Pele for them to model themselves after. What else can I say? Hawaii rocks! Want to learn more? Start here: www.gohawaii.com.